Let SeaWind Aviation be your first choice for Misty Fjords tours, Ketchikan Alaska bear viewing, or Ketchikan flightseeing tours! We’re Steve and Lesley Kamm, your hosts at SeaWind Aviation. We’re a small, closely run, Ketchikan family business with 17 years of Southeast Alaska commercial piloting experience. 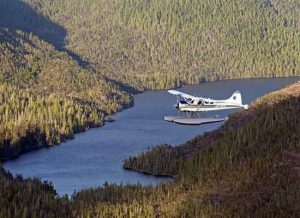 Our meticulously maintained DeHavilland Beaver floatplane is perfect for local Ketchikan Alaska bear viewing and Misty Fjords flightseeing tours. Believe us, a flight from Ketchikan over the world-famous Misty Fjords National Monument is the aerial adventure of a lifetime! Our Alaska bear viewing tour combines flightseeing with a land excursion for a close-up and personal experience with Alaska bears! Our glacier tours are the highlight of any Ketchikan flightseeing tour. Seaplane tours above historic Ketchikan, Alaska, show you a bustling port city and its mountainous backdrop. For a true Alaska adventure, let us fly you to a remote cabin on a lake or beach for out of this world fishing and hiking. 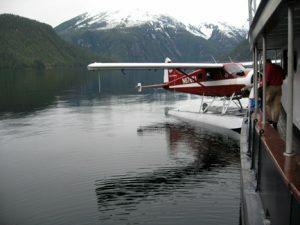 Flightseeing tours to the Misty Fjords National Monument and bear tours in the Tongass National Forest are operated under permit issued by the USDA Forest Service. Come join us in Ketchikan and experience first hand why our guests and friends come back year after year! Give us 45 minutes and we’ll show you the Ketchikan area the way eagles see it. Fly over the First City’s historic waterfront and see how our town developed between the ocean and steep mountains. Then fly above the so-called Ketchikan Alps: tall, snow-clad mountains right back of the city. It’s not uncommon to see mountain goats or bears above timberline. The flightseeing tour includes a landing in a high-mountain lake or remote saltwater inlet. You’ll have a chance to get out and take in the beauty of unspoiled Alaska, just miles from one of the state’s busiest cities. Other tours include the Misty Fjords Tour and the Misty Fjords Flythrough. For more Seawind Aviation information visit their official site: www.seawindaviation.com. Here is the Misty Fjords National Monument and Alaska as you have dreamed it. Here is Alaska from on high, a soaring flight of discovery that takes you as far as your imagination. Here is a flightseeing experience that only Southeast Aviation can deliver – from the majesty and incredible landscape of the Misty Fjords National Monument, to the stone-cold beauty of ancient glaciers, from a bear-viewing excursion that is sure to please to a flight above Ketchikan guaranteed to give you an overall view and deep appreciation of life on the Inside Passage. From its base on the historic Ketchikan waterfront, Southeast Aviation is poised to take you over some of the most awe-inspiring Alaskan scenery to be found anywhere in this “Great Land” – within less than 100 miles you can experience just about everything Alaska has to offer. Ask the pilot all your Misty Fjords questions inflight And, as unmatched as you will find the scenery and the Southeast Aviation experience, it is even more enjoyable and meaningful with one-of-a-kind, up-close-and-personal flying tours that feature two-way headsets between you and your professional pilot. Southeast Aviation flightseeing is designed to fit your schedule. Our trips originating from the waters of Tongass Narrows vary in length and character, depending on your schedule, but each has been designed to provide affordable lifelong memories. Pacific Airways provides daily scheduled flight service to communities throughout southern Southeast Alaska. With convenient check-in at the Ketchikan International Airport and our facilities on the waterfront in Ketchikan. Charter service is provided throughout Southeast Alaska. Services include hourly charters, aircraft and pilot stand-by, fly-in charters for fishing and hunting trips, charter service to USFS cabins, and flight-seeing charters to magnificent spots throughout the area.